Shoot me your addresss and your preference for trading card action, and I will send some your way. (I totes could have just emailed you but I said I'd announce on the blog so I am announcing on the blog!) ALSO, allow me to present to you, Cait's most excellent short story! With a side of my sandwich! My awesome Sandwich, rescued from the camera at last! Thor’s red-gold eyebrows furrowed in concentration as he lowered the final piece onto his masterpiece. The bread settled into place with barely a sound, and the god stepped back with a grin to admire his work. Now THAT, he thought, is a SANDWICH. The smile became a scowl. “Your timing is atrocious, Freyr,” he growled. “Thank you,” he said, hefting his hammer. Loki wouldn’t be at all pleased when he finished with him. Thor waved to Freyr and let his hammer drop beside him. Loki always seemed to take such joy in messing with him at the absolute worst times. He shrugged it off and heaved a satisfied smile as he settled into the seat, staring lovingly at his sandwich. Even in his hands, it was still huge. The lettuce crunched as he raised it to his mouth. He squeezed his eyes shut and resisted the urge to reach for Mjolnir. “What?” he snarled. He growled to himself, and set the sandwich down gently. He shot a glance at his daughter, and she flinched at the lightning in his eyes. “I’ll make sure no one touches it,” she swallowed. “But I just…” Thor’s countenance fell as he shot a longing glance at his sandwich. Thor grumbled, but Baldur at least had the good grace to look sorry. “Sif…” He was beginning to despair of ever seeing his sandwich again. Heimdall’s golden eyes stared back, and Thor sighed again. Thor’s head fell to his hand. Thor’s shout rocked Asgard, sending lightning shattering through the aether. His eyes glowed blinding white, and electricity flickered across his skin. The gods all stood, staring. His eyes flashed back to blue as he turned, sweeping his gaze across the assembled company. No one moved. Thor gave a small smile, and stalked back to his seat. Hammer still in one hand, he picked up his sandwich, settled back, kicked his feet up, and took a bite. Now THAT, he thought again, is a damn fine sandwich. And a finer Thor sandwich story, I never did see. While Mia and Tyler are suffering through Baldur's interrogation, Amaliaz, Thor, and the rest of the zombies, have been left to their own devices... with Bragi. Poor planning on someone's part, that's for sure. We were alone in the room. Well, except for the zombies, now busying themselves pasting the collected gold coins to the walls under Adam’s supervision. Bragi was pinching his nose as if it had been trying to bleed, and Thor had turned half-toward the closed door, his head cocked, his grip on the axe still white-knuckled. He pressed a finger to his lips, silencing me, and his eyes narrowed. Thunder gods have better hearing than you’d think, considering all the thunder blasting out their eardrums, but if Thor was listening for something, I had no idea what it might be, and I didn’t see how he could hear anything over the zombies scrabbling about the other side of the room. But apparently, whatever he’d been hoping to hear reached him, because his eyes flashed a brilliant blue-white, and he bared his teeth in a way I recognized as the opposite of a smile. I was too late. In one motion, he had spun, grabbed Bragi by the collar of his shirt, and slammed him against the wall, the axe blade pressed against his throat, just below his ear. A line of blood bloomed beneath the steel, and Bragi made a garbled noise, half-protest, half-shock. I wasn’t the only one staring. The zombies had all stopped scrabbling and pasting, their eyes wide. “What did you tell her?” Thor growled. Thunder gods are immoveable forces AND unstoppable objects, and Thor wasn’t in any mood to listen, besides. But the fact of the matter was, getting all defensive now would only confirm whatever suspicions Bragi had. Thor was making us look guiltier by the minute. Not that we weren’t guilty. And that was the problem, really, wasn’t it? 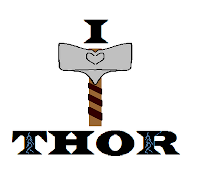 Because once, years ago, in the very beginning of our relationship, before I had learned the rules of not ever being more than friends with a thunder god, Thor had expressed an interest, and I had expressed one back. Um. Physically. Of course, we’d been interrupted before the most critical stage by the electrocution, and my heart stopping, and the resulting emergency jump start via lightning and Thor’s palm. We had both learned a valuable lesson regarding the fragility of the human body when large voltages of electrical current are passed through it, and needless to say, we hadn’t tested it any further. Thor had been too guilty to even look at me, and it was months before we so much as brushed shoulders during a movie. But that was why he’d learned to refine his life-saving techniques – even Thunder gods are guilty of wishful thinking, I guess, and there was always the off-chance I might get singed in a scuffle. But if Sif learned the truth, how close we had come to, ahem, consummating our feelings, this nonsense with Asgardian gold and Bragi would be nothing compared to what she’d rain down on my head. Sif was a goddess of prosperity and foodstuffs, in the modern day, as well as the typical beauty with a touch of fertility just to keep from being left out, and what she could give, she could also take away. I’d find myself lucky to call a cardboard box my home if she didn’t kill me outright with some disturbing and painful disease – financial ruin and sickness were just two of many things a thunder god couldn’t fight, no matter how heavily muscled he was. And Thor definitely had muscle to spare. “Poetic,” Adam muttered, and the zombies all murmured agreement. I shot him a look of exasperation and he cleared his throat, whistling innocently as he urged the other zombies back to their crafting. Thunder snarled, lightning snapping and sparking off Thor’s skin. The zombies scattered, chasing the flares of light that tumbled across the carpet. I sank down the wall, hugging myself. I’d be wishing for the easy death of Jormungand’s venom before long, I was sure. For a mortal, it would be quick, if not painless. What Sif had in store for me, I could only imagine. Thor growled, and the room flashed brilliant, burning white, the crack of thunder so loud I thought my skull would split in half. When I blinked back the afterglow of lightning etched behind my eyes, Bragi was charred black, still, and silent. Klikk for Mia's half of this episode! Today is your last chance to enter to win Half-Naked Thor and other Avengers/Thor trading cards! Details are HERE, and you have until 9pm!! If someone does not fight over Half-Naked Thor, I think he'll be sad. And we wouldn't want to discourage him into putting a shirt on, now would we? P.S. AVENGERS ROCKED MY SOCKS. *I was going to show you my sandwich from the other day (Lemon Pepper Chicken, Prosciutto, Fresh Tomato, Assorted Lettuces, Swiss cheese, Balsamic vinegar, Sweet Pickles, and just a hint of mayo, on fresh Italian bread) but el husband made off with the camera before I could upload the picture!! If you're wondering, it was absolutely delicious. I only wish I'd had fresh basil to top it all off! I'll try to upload it later, provided he does not leave the camera at work for some less-important reason, like taking pictures of airplanes. Silly el husband, Sandwiches are More Important than AIRPLANES**! ** totally not in this house. El husband would go hungry before he gave up something airplane related. That may be a slight exaggeration, but only SLIGHT, I promise you. I groaned. My skull felt like it had split open, and then I groaned again, because I would never get all the glitter washed out of my brains if it had. Glitter of the brain. If I opened my eyes and the world glinted and sparkled, I was going to slit my own throat. And Mia. Oh boy was Mia going to regret this. See if I ever asked Thor to resuscitate her again. I sat up carefully, holding my head just in case it decided to roll off somewhere. And then I stared. “Enough!” Thor shouted, thunder cracking so loud the room shook. I moaned. My head was going to explode if he did that again. 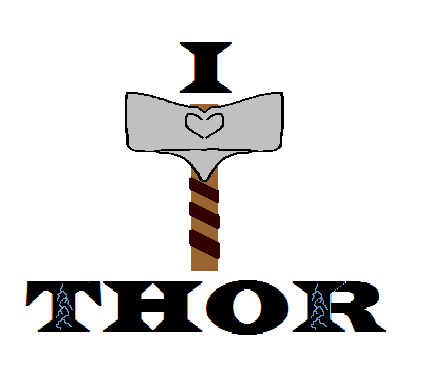 Thor knelt beside me, his hand finding the lump on the back of my head and his eyes flaring blue-white. “Forgive me for not following sooner.” His gaze burned across the room to Mia, kneeling on Bragi’s chest, and then he stiffened. Slowly, he reached out, picking a piece of gold from a mess of feathers on the carpet. A coin, stamped with Yggdrasil, the world-tree one on side, and One-eyed Odin on the other. Asgardian Gold. The moment Baldur stepped into the room, the zombies gave up their chase for gold coins, stumbling toward his shining brilliance instead. There were dozens of them. Each one a never ending supply of wealth to the owner. Thor turned the coin between his fingers, then passed it to his brother. The glow of Baldur’s face dimmed, then darkened, and I realized suddenly that I had never in my life seen Baldur truly angry. His eyes flashed silver, and his expression hardened, as if he had been chipped from stone. Mia shot me a questioning glance, and I shrugged. There was no possible way that Bragi could escape, now. And the way Baldur was looking at his brother, I had a feeling Bragi knew better than to try. Mia clambered up off Bragi’s chest, brushing stray feathers from her pants. Tyler and Adam waited until she had danced back a few steps before releasing Bragi’s shoulders and legs. The god of poetry snarled at them as he rose, dripping glitter and stained with zombie drool. But he didn’t meet Baldur’s eyes, or Thor’s. I wasn’t sure if it was because he’d stopped shining quite so attractively, or because they realized his patience was running dangerously thin, but when Baldur stepped forward, the zombies parted like the Red Sea before Moses. He bent, collecting the battle axe I’d dropped after Mia had dropped me, and examining the blade. “Thorskona was carrying this when she entered the room?” he asked. “Er,” Mia said. “Of course! Absolutely my plan all along!” She beamed at me, and I glared back. “I wasn’t really going to kill him,” I grumbled. Episode X point V can be found HERE, as per usual. Don't forget to enter the #HalfNakedThor contest!! It will only cost you a sandwich! Arianna has lived in fear of her father, the king, since the day she saw him throw her mother to her death from the castle wall. The king despises her, convinced she is the product of the queen’s betrayal, and her future is grim: marriage to a man who will abuse her, if he does not get them both killed for treason first. When she discovers an orc, beaten, chained, and trapped inside a magic mirror in the king’s tower, Arianna is struck not by horror, but hope. Her whole life, she has lived among her father’s nobles, men with pretty faces and cruel hearts. Even with his grey-green skin and curved tusks, Bolthorn is no monster. Beneath his heavy brow, his yellow eyes glow with warmth and kindness, and in his immense strength she cannot help but see her own freedom. Bolthorn never imagined his prayers to the ancestors would be answered by this woman, whose strength of spirit rivals any orc's. He needs her help to warn his people before King Gunnar marches his army through the mountain to enslave the orcs, but all he can offer Arianna is the love of a twisted creature, born to ice and darkness. No orc has ever been bound to a human, even if she can survive winter in the mountains. If she accepts his love, she will have no choice but to exile herself from everything she has ever known, for once they cross the mountain, there will be no return. And the bitter winter is the least of what threatens them on the other side. With the blood of the king flowing in her veins, Arianna can open the magic mirror that imprisons Bolthorn and free them both. But if they are to escape to the orcs without bringing war with them, the king, her father, must die. BLOOD OF THE KING is a 104,000 word romantic fantasy novel with a touch of Norse influence. The room was forbidden, but staring into the mirror hanging from the opposite wall, Arianna did not understand why. It was empty, but for the framed, silvered glass, the only light coming from the arrow slit windows, one on either side of the mirror. No tapestries hung on the rounded walls, no furnishings to speak of, and no hearth for a fire against the frozen north wind that bit at her nose and turned her cheeks red. At first, Arianna only saw her own reflection in the glass, no more than a shadow of movement in the dim light. But when she moved away toward the arrow slits, something else stirred in the dark and a low growl filled the silence of the room, knotting her stomach. She froze, pressing back against the cold stone wall. Nothing stood behind her, to cast such a reflection, and nothing else moved in the room itself. A breath of fear escaped her lungs, loud as thunder to her ears, and the too-tall shadow in the mirror shifted again, with a clank of chains and a flash of sickly grey skin behind the glass. Inside the glass? “Who’s there?” the voice called. She didn't dare answer. If whatever lived behind the mirrored glass told the king she had been in the tower, she’d be fortunate to escape with less than ten lashes. So here is the deal, friends and followers: I find myself in possession of a number of extra THOR and AVENGERS trading cards. Among these duplicates are a half-naked Thor, a Thor-in-the-mud and several Thor in the new bulging-biceps costume in various poses of flex. I think these trading cards deserve an appreciative home, and to this end, I feel the need to invoke the right of blog-contest. 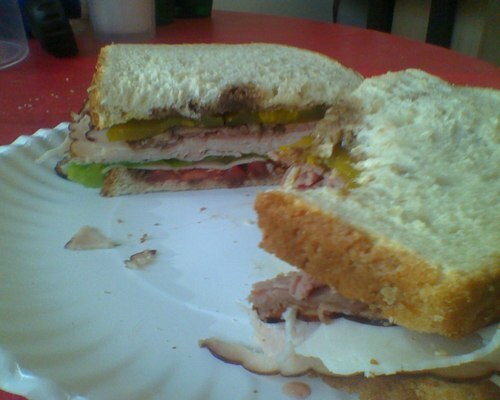 2) Write a short story (1000 words or less) which involves a sandwich, or sandwiching. Your character could be out to lunch, and the sandwich might be spilled in their laps, causing an uproar or a meeting of the eyes! Or maybe your characters are making sandwiches and fighting over who gets the last piece of lemon-pepper chicken! (Guys, Lemon-Pepper Chicken is AMAZING.) I do not care, really, what the situation is, as long as a sandwich is present in a crucial way. Maybe Thor is experiencing the excellence that is Jimmy Johns for the first time. Whatever! Write it, post it on your blog or in the comments, make sure I get the link! I will totally post a master list of all links with your blog stories/sandwich photography on my blog after all entries are in. You have ONE WEEK from today. All entries must be linked in the comments by May 8, 9pm eastern. I will choose one winner from each category (or, if there is only one category of entries, two winners from that category) and also draw one entry at random. This means you may enter once in each category (but you will only win once). The winners' names will be posted on this blog the following Tuesday, and if you send me your address within one week of the names being posted (USA only, sorry!) I will send you some AVENGERS/THOR trading cards, including at least ONE Thor card. If you want to include a preference (half-naked, Thor-in-the-mud, Any-Thor-will-do, forget-Thor-I-want-Loki/Odin/Hogun/NewHulkDude/Cap/AgentCoulson/NickFury etc) when you send in your address, I will do my best to accommodate, first come first serve. Make Thor proud, friends and followers! But more importantly, have fun!